Shelton, CT — June 23, 2017 Gigartina Red Marine Algae (RMA) Ointment by Vibrant Health® has been awarded Remedies Body Care Award for 2017 in the Skin Care category. While Vibrant Health, a natural supplement company established in 1992, holds over 18 awards for various products, this is the first award for Gigartina RMA Ointment. 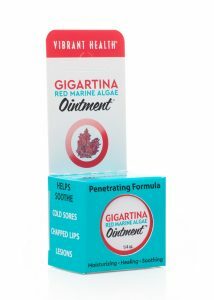 Gigartina RMA Ointment is a soothing, replenishing, and healing skin ointment, loaded with sulfated polysaccharides from a specially selected species of Gigartina red marine algae. These polysaccharides have demonstrated a unique ability to support immune function at the cellular level. In addition to the powerful anti-viral effects of the red marine algae in the ointment, the delivery method is unique: emu oil and 14 other ingredients nurture healthy skin and ensure fast, deep absorption into the affected area. Most Award-Winning Green Food Supplement Has Won Again!